A slightly muddled but satisfyingly earthy western, Vera Cruz deploys undeniable star power to maintain thrust in a story of greedy mercenaries getting entangled in the Franco-Mexican War. 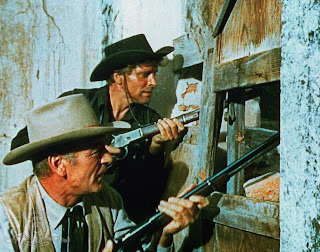 It's the end of the Civil War, and defeated confederate soldier Ben Trane (Gary Cooper) travels south to Mexico, looking to sell his services as a mercenary in any convenient new war. 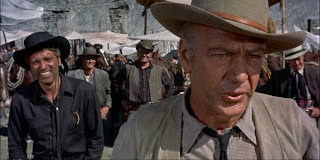 He meets Joe Erin (Burt Lancaster), the ruthless and charismatic leader of a gang of thugs including Donnegan (Ernest Borgnine) and Pittsburgh (Charles Bronson). Ben and Joe mistrust each other but agree to join forces, as a populist but under-powered rebellion led by General Ramirez (Morris Ankrum) is brewing against the occupying French rulers. After Ben saves the life of local girl Nina (Sara Montiel), Ben and Joe turn their backs on the peasant rebels, selling their services instead to the Marquis Henri de Labordere (Cesar Romero) who recruits them on behalf of Emperor Maximillian (George Macready). Maximillian entrusts the Marquis, Ben, and Joe with the task of escorting Countess Marie Duvarre (Denise Darcel) through rebel territory to the City of Vera Cruz. But the Countess is just a distraction for the real purpose of the trip: hidden in her wagon are $3 million in gold coins needed for troop payments. As they each try to secure the biggest slice of treasure for themselves, Ben, Joe, the Marquis and the Countess engage in a fierce game of shifting allegiances and treachery. Vera Cruz over complicates itself in the final third. With the four main characters, plus rebel girl Nina, all conspiring against each other to gain the largest share of the gold, who is pretending to agree to what with whom starts to blur. While the focus on plot is welcome, the script by Roland Kibbee and James R. Webb reaches too ambitiously for a complexity that the genre cannot handle well. But director Robert Aldrich is otherwise able to maintain a good mix of action and character development with balanced pacing, steering the film towards a grand finale, a storm-the-fort climax bolstered by tens of explosions, hundreds of extras, thousands of bullets, and a lot of death to the wicked. Vera Cruz benefits from a healthy and sustained tension between the characters of Ben and Joe. The two men are alike and different, both capable of killing, both hungry for money, and both primarily looking after their self-interest. But there is more sorrow beating in Ben's heart, a broken man who lost everything in the Civil War, now looking for something new to believe in. Joe has long since stopped looking, simplifying life to a strict pursuit of riches at the expense of others. The film never defaults to a buddy movie, the two men continuously keeping a critical eye on each other, looking for every opportunity to gain the advantage. Cooper gives Ben the requisite world-weariness, his eyes and resigned demeanour conveying the disappointment of a life thrown off course by the ravages of war. Lancaster's Joe is an over-abundance of cocky toothiness, Lancaster channelling the exuberant physicality of screen rival Kirk Douglas, rather than his typical more laid-back persona. Cesar Romero, Ernest Borgnine, Charles Bronson (billed as Charles Buchinsky) and western stalwart Jack Elam provide depth in support. When the story gets ensnared in its own cleverness, the tough guys of the west ride to the rescue.